Boxing Day ham | What's for tea tonight dear? What's for tea tonight dear? I recently published a version of this recipe in My St Margarets Magazine and as the online version is not yet available am more than happy to share it here. 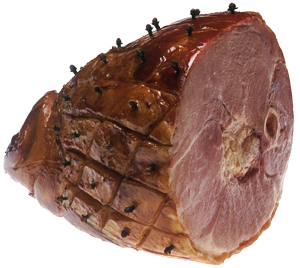 PS – the picture above is not my own ham as the tester versions were wolfed down before I could I lay hands on my camera. Once the next ham is out of the oven I will fend off the ravening hordes for long enough to take a couple of quick snaps. Promise. By now your Christmas menu is undoubtedly decided, but what about Boxing Day, the very feast of Stephen? Well one of my own traditions for 26th December is to pre-prepare a ham to provide ample grazing opportunities whilst leaving me with plenty of time to try on my new slippers [hint?] and gaze out at the snow – all deep and crisp and even. Nigella famously does it with cola, so why not try this version with an even more aromatically herbal fizzy pop? This can be made up to a week in advance and will happily simmer away to itself whilst you get on with something else like, oh, wrapping my new slippers [enough hints already?]. Take a 2.75kg boneless mild cure piece of gammon and place in a pan along with 250ml red wine, 1 litre dandelion and burdock, 1 large onion roughly chopped, 1 halved head of fennel, 2 cloves of garlic, 2 star anise, 6 cloves, 1 tablespoon caraway seeds and 1 of black peppercorns. Top up with water if necessary to cover the ham and simmer for 3 hours. When the ham has cooked and cooled carefully remove the skin, make a diamond pattern of crossed lines in the fat and stud with cloves at the centre of each diamond. In a pan melt 50g membrillo and a tablespoon of redcurrant jelly with 3 tablespoons dry cider, 1 teaspoon wine vinegar and a pinch of smoked paprika. Pour over the ham and glaze in a 230˚C oven for around 15 minutes, brushing and basting from time to time with the glaze. Allow to cool, wrap, and refrigerate until needed. Are you looking for a writer? If anything you find here whets your appetite enough to consider commissioning a piece then please get in touch - details are on my Contact page, and you'll find biographical information on the About page.